Hi there! I’ve just released version 1.19 of Cardinal Quest 2. This new patch fixes a bunch of bugs, tweaks some class skills and adds a new Legendary weapon. Enjoy! Hey everyone! 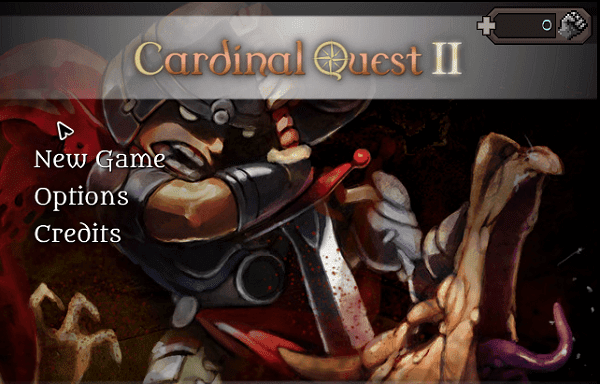 Cardinal Quest 2 is now at version 1.18. This patch updates the Tower boss floors, introducing several new layouts and guaranteed gear drops from bosses. Have fun! Hey all! Cardinal Quest 2’s just hit version 1.17. This patch fixes a bunch of minor bugs, tweaks a few items, reintroduces “Haste” and adds a new spell for all classes to find! Hello! I’ve just patched Cardinal Quest 2 to version 1.16, adding a brand new perk to every class and tweaking loads of things. The Thief has two new talents, the Pugilist has a whole bunch of changes, the Wizard’s wisps and Enslaved pets will follow you from level to level… and there’s plenty more! Hey all! Cardinal Quest 2 just hit version 1.15, adding five new Legendary items to find. I’ve also made Legendaries show up a little more often on easier difficulties and rebalanced how often each one shows up in The Tower, so you’ll get to use them more! Use the Arrow Keys or click the mouse to move around. Move into enemies to attack them. Click yourself or press Space to wait a turn. Click skills or press their hotkeys (default: 1-5) to use them. Skills recharge! Click the items above the skill bar to use them. For detailed help on the UI start a game, click the “Menu” button in the bottom right and select “Help”. 0 Response to "Cardinal Quest 2"